Please note, that we can only answer your questions by phone during Business hours From Monday until Friday 9h00am to 6h00pm (Eastern Standard Time). For a technical related issues, it's essential that you have your Support ticket number to better assist you. **Only specific ECU types must be sent to Unitronic for immobilizer defeats. We recommend contacting Unitronic or an Authorized Unitronic Dealer prior to sending your ECU. If you did not receive your Flash Report, please contact your Authorized Unitronic Dealer that performed the installation to verify that your email address is accurate and up to date. 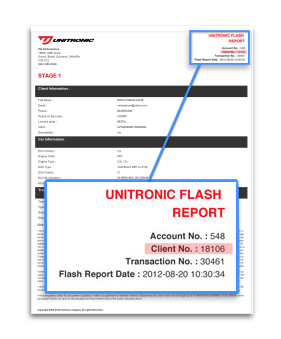 Your Authorized Unitronic Dealer will be able to re-send your flash report.